Everyone needs a room of their own, and a little wild-proofing goes a long way to keep everything, and everyone, in their own place.\ (Photo: Alan Howell © Star Path Images, used with permission). I’m sorry Ol’ Blue Eyes, but the line that says if you can make it in a big city you can make it anywhere doesn’t hold true for everyone. For a lot of wild species, especially those who can tolerate living close to human beings, Gotham—and nearly every other town and suburb—has some significant advantages over small-town and no-town life. Let’s start with the basics. All living creatures need, at minimum, four things to survive: air, water, food, and space. Air is equally available in most habitats (generally speaking), so one place is about as good as another when you’re looking to put down roots. City mouse, country mouse—neither has an oxygen advantage. Call it a draw. However, finding something to fill your stomach and quench your thirst can be a full-time job in undeveloped areas, while living near people pretty much guarantees that #2 and #3 on that list will be plentiful. Parched? Even in arid regions, even during a drought, water is much easier to find in the city. 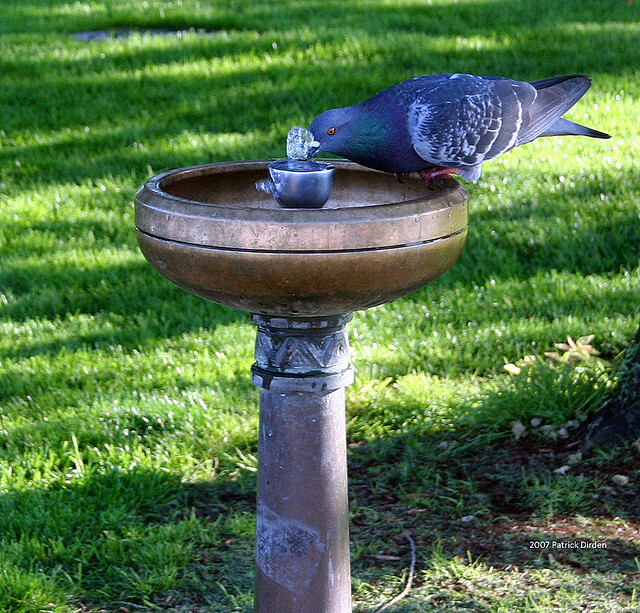 Think birdbaths, hoses, fountains, sprinkler systems, swimming pools, park ponds and lakes. Chalk one up for the city critter. Hungry? You’ve got your birdseed, your suet, your stale white bread—people hand that stuff out like there’s no tomorrow. Then there’s the never-ending supply of second-hand snack dispensers, available in medium (trash cans), large (dumpsters), and big-gulp (landfills). Plus you’ve got your “repurposed” vittles—garden produce, fruit trees and bushes, grass seed, expensive landscaping plants, pet food… and pets. Advantage urbanites. The one thing that’s hard to come by for both human and non-human city residents is quality real estate. Actually, it’s the fact that food and water are so bountiful that creates the wild housing crisis. In “natural” habitats, these resources are finite so the creatures living there vigorously defend access to them by establishing territories to exclude new residents, especially during breeding season. In the built environment, as illustrated above, food and water are, for all practical purposes, limitless. The carrying capacity of an urban or suburban landscape is much higher than surrounding undeveloped habitat, in large part because food, in all its myriad forms, is removed from rural areas and trucked into the city on a daily basis. More food = more critters… but the space available for nesting and denning sites doesn’t expand at a similar pace. In fact, development removes many natural denning and nesting sites, so finding a nice traditional home takes more effort. 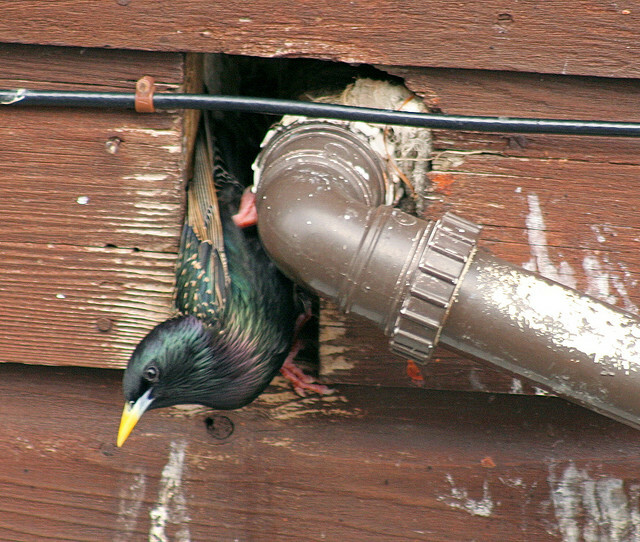 Is it any wonder that urban wildlife—comprised primarily of the most adaptable of species—start thinking creatively about dryer vents, chimneys, attics, garages, decks, and sheds? Think of it from a wild perspective—with a little behavioral flexibility, they and their loved ones can be warm and dry, while someone else pays the heating bill! Now, most of the people I meet fall into one of two major camps regarding wildlife: “love-love-love-it,” and “live-and-let-live.” It’s only after a human-wildlife conflict of some kind has occurred, usually resulting in an expense for the human, that people start bad-mouthing their furry, feathery, and scaly neighbors. Prevention is the best conflict resolution strategy I know. 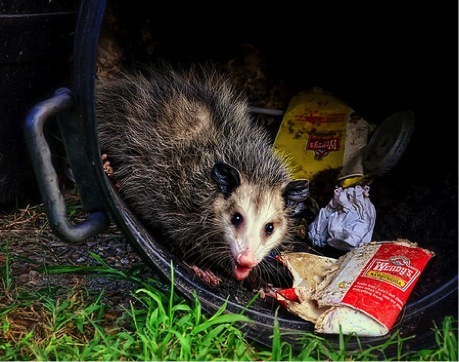 Autumn is when many animals begin to look for a place to hide out from old man winter, and sunny fall days are also a great time to get outside and tackle those wild-proofing maintenance and repair chores around the house and garden. 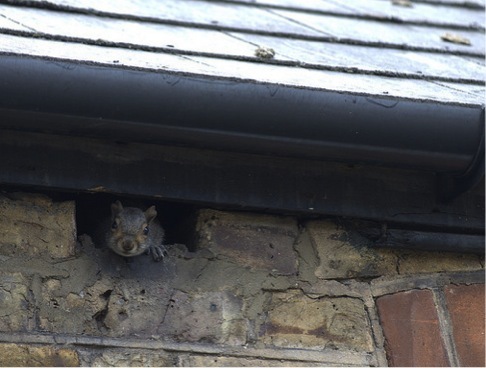 Once you’ve made it more difficult for squatters to move in, staying on friendly terms with next-door nature is a breeze. There’s a nice little bonus for doing your chores, too—by sealing up all those potential entryways you’ll keep out the cold winds, reducing your heating bill and your carbon footprint. Such a deal! For more helpful instructions, along with a wealth of information on humane methods for preventing and solving all sorts of human-wildlife conflicts, I highly recommend a book titled Wild Neighbors by John Hadidian of the Humane Society of the United States, available new and used from all the usual online booksellers. P.S. Homes are but one venue where human-wildlife conflicts occur. To hear about a few others, check out last week’s With Good Reason broadcast/podcast, Beyond Campfires and Cookies. The focus of the second feature story is none other than yours truly. © 2011 Next-Door Nature— no reprints without written permission from the author. Thanks to the following photographers for making their work available: Alan Howell/Star Path Images (raccoon, used with permission); SP8254 (pigeon, Creative Commons license); Jason Ahrns (opossum, Creative Commons license); John Haslam (European starling, Creative Commons license); David Ginsberg (fox, Creative Commons license); and Joel Down (squirrel, Creative Commons license). 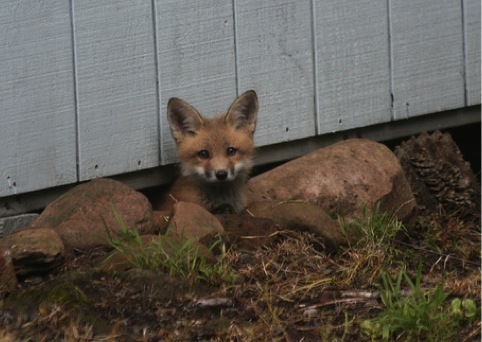 This entry was posted in behavior, birds, Habitat, human-wildlife conflict, mammals, nesting behavior and tagged animal behavior, backyard wildlife, Biology, Bird, birds, habitat, human-wildlife conflict, mammals, Nature, postaweek2011, suburban wildlife, urban habitat, urban wildlife, watchable wildlife, wild birds, wild-proofing, wildlife by Kieran Lindsey. Bookmark the permalink.